Lanterna Fiorentina is a small and comfortable Bed & Bed placed in the heart of the 18th century Florence, memory of the years during which Florence was the Capital of Italy. "IN CENTRO" is a brand new B&B, we just opened in April 2007. 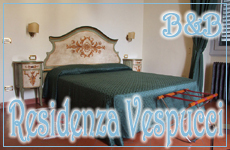 Our concept of B&B was a place for young people coming to Florence on holiday, businnes or for study purposes. Our beautiful guest house is really characteristic and it is located in the heart of the Florentine historical centre. �Locanda Gallo� is in one of the most important "historical districts" of Florence the "Quartiere San Lorenzo".